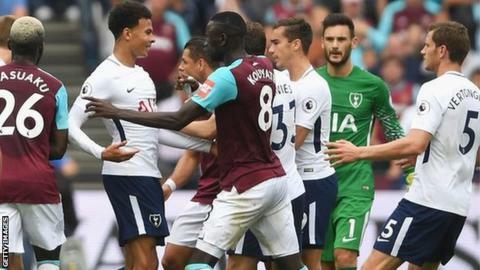 The Football Association charged the clubs over a melee late in the game, which Spurs won 3-2 having almost squandered a three-goal lead. Five players were cautioned by referee Michael Oliver in stoppage time. West Ham's Andy Carroll, Winston Reid and Andre Ayew were booked, along with Spurs' Eric Dier and Fernando Llorente. Tottenham had to endure a nervy end to the Premier League match after being reduced to 10 men in the 70th minute when summer signing Serge Aurier received a second yellow card.